There are currently (as of 11th Feb 2015) 1544 Potentially Hazardous Asteroids (PHAs). These are small bodies that have the potential to make threatening close approaches to the Earth. Most are very small, from a few metres to a few tens of metres across, but there are quite few larger ones a few kilometres across. Clearly if one of these larger bodies hit the Earth it would make a mess. A big mess. Fortunately no PHAs are known to be on a collision course with the Earth. 2004 BL86 is one such PHA which was thought to be around 600–700m across. It’s orbit is known well enough that it has been given a numeric designation (it’s name means it was discovered in 2004 and BL86 is a sequential tag indicating it’s order of discovery in that year). On 26/27 January 2015 it made a close approach to Earth, about 3.1 times the Earth-Moon distance away at closest. Small asteroids come close to Earth all the time, often closer than this, but what made this one unusual was the size of the object. This large size meant it would be bright enough to be readily visible by amateur astronomers. As it approached Earth professional observatories started observing the asteroid using radar and it was discovered that it was an almost spherical object (unusual for small bodies) around 325m across. They also discovered it has a small moon (this is not unusual for PHAs). After observing the asteroid visually through my telescope (likely to be the highest numbered asteroid I will ever view visually) I took a couple of videos using my asteroid occultation setup and a sequence of 20s images taken 20s apart. 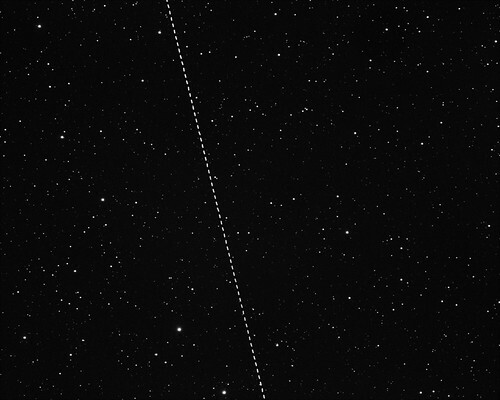 Once aligned and stacked these images show the asteroid’s movement as a dashed line. The asteroid appeared about as bright as a 9th magnitude star (typically stars down to 6th magnitude are visible naked-eye from a very dark site).